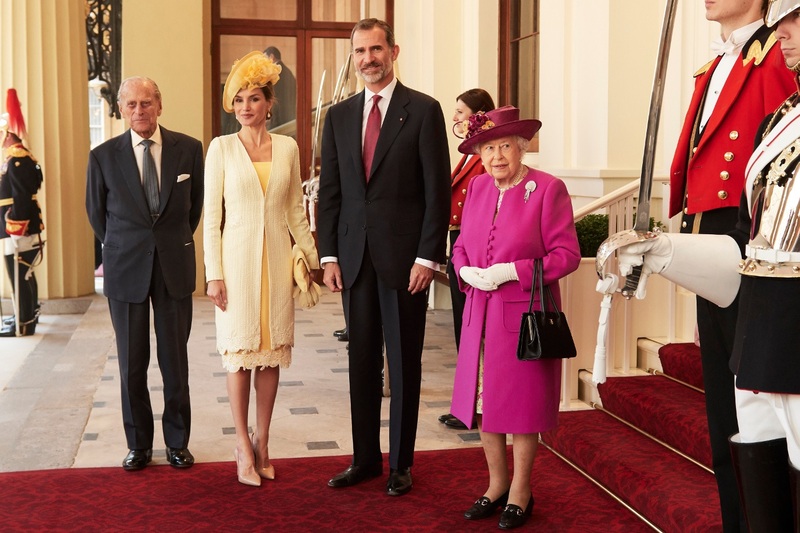 The Royal Order of Sartorial Splendor: Royal State Visit of the Week: Spain in the U.K. 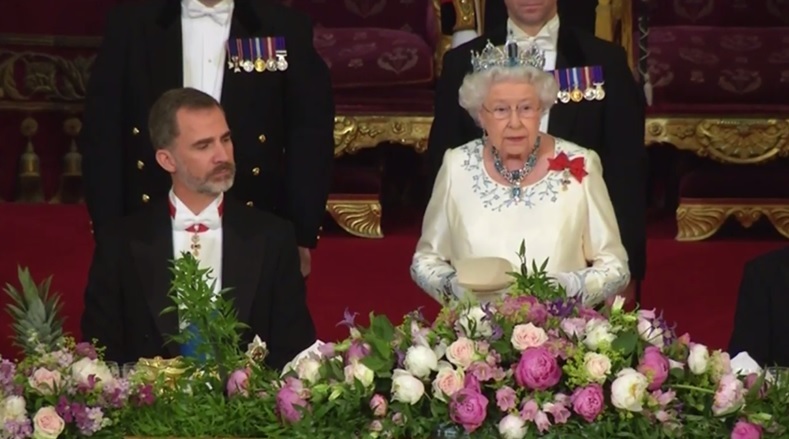 The long-awaited state visit from Spain to the United Kingdom has begun! 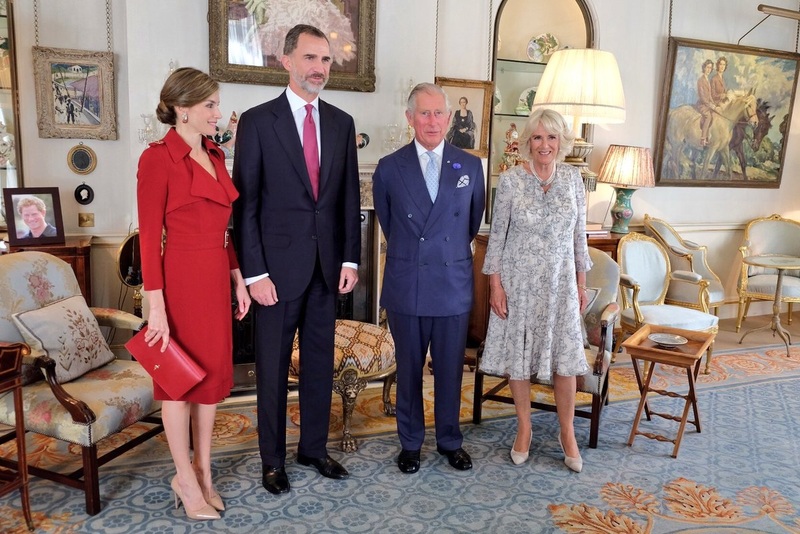 King Felipe VI and Queen Letizia arrived on Tuesday, a day ahead of the visit's official start. Letizia traveled in this repeated Hugo Boss white outfit, which is totally what I wear to travel, you know, just minus the heels and the skirt and the crisp white color and...oh, never mind. The Prince of Wales and Duchess of Cornwall met the Spanish royal couple at the hotel on Wednesday and escorted them to Horse Guards Parade, where they were officially welcomed with full pomp and circumstance by Queen Elizabeth II and the Duke of Edinburgh. 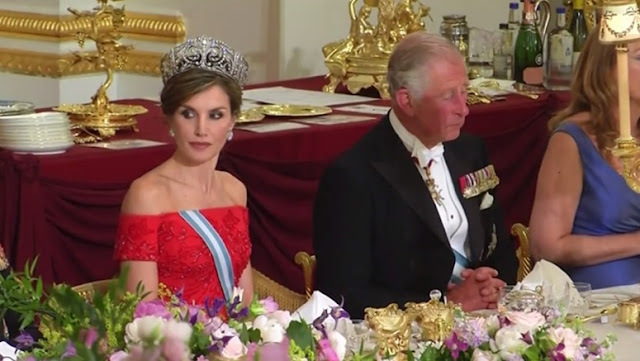 The Spanish royal family doesn’t do the hat-n’-gloves thing in their regular business, but Queen Letizia is always game to pop on a chapeau when the occasion calls for it. Like her mother-in-law in 1986, Letizia recognized that a British state visit is the very definition of a hat occasion. She’ll never meet Camilla’s levels of hat froof (NO ONE POSSIBLY COULD), but she was admirably game to try in the Maria Nieto hat she wore to match her Felipe Varela outfit. 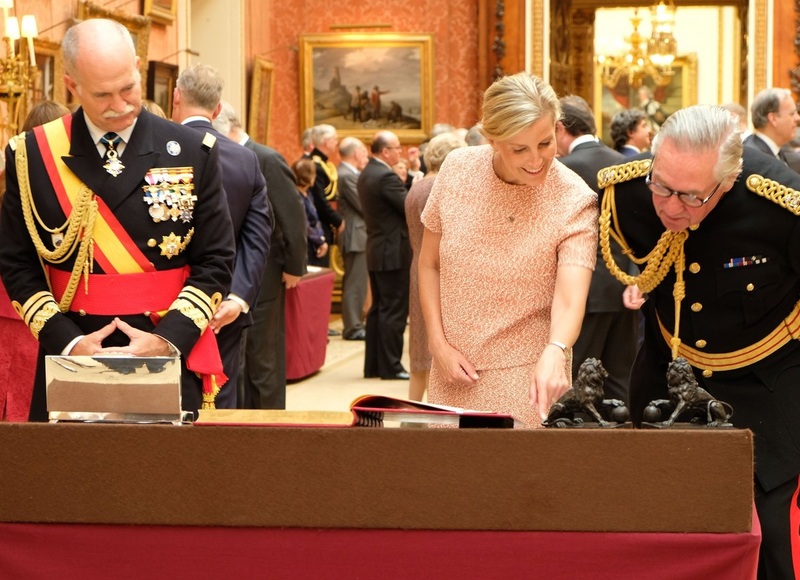 The yellow was an interesting selection – feels an unusual choice for her, right? 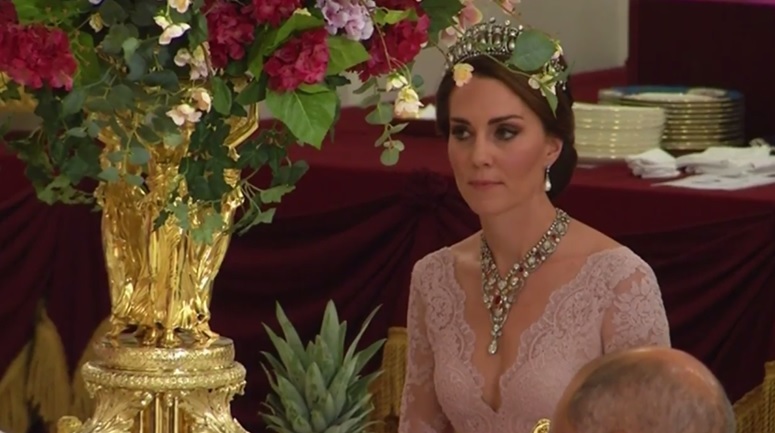 – and ended up coordinating her nicely with the yellow flowers on Queen Elizabeth’s hat. South of the hat, though, things started to get a bit awkward. And by the hem, it started to get regrettable. The lower hem detail is a play on two yellows gone too far. 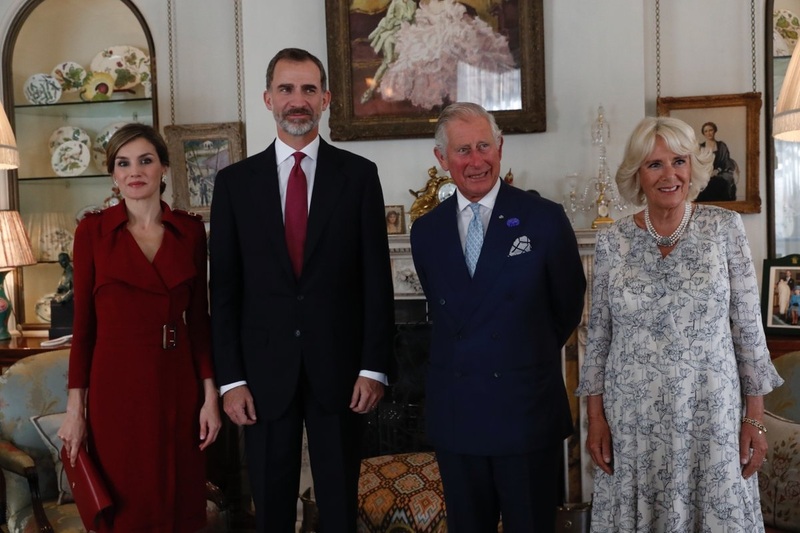 Hello, Countess of Wessex! You know, Sophie's really mastered the "oooh, look how interesting!" pose. Multiple dukes have also joined the party: Cambridge! York! Gloucester (even though he's not in this shot)! 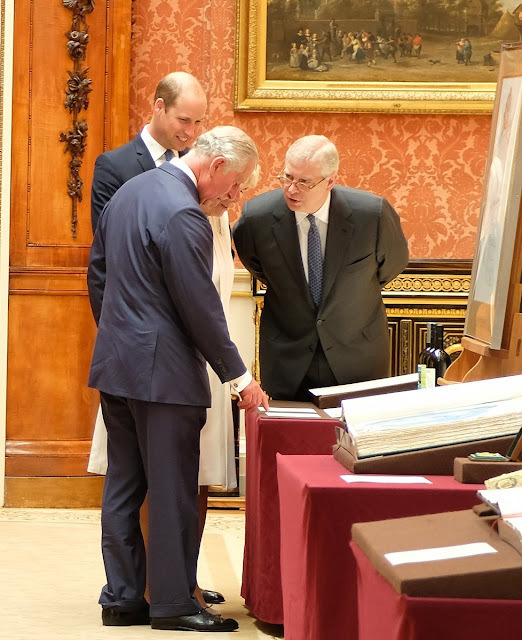 Swimming with royals, this place is - and we actually get to see it, for a change. I'm already loving this increased coverage. ...we've got a saucy belted coat...we've got ruby earrings. 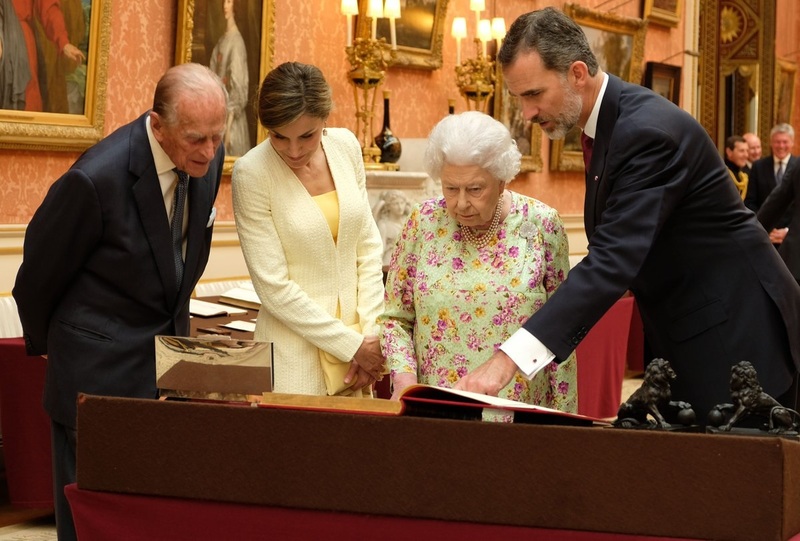 She's also doing a bit of "diplomatic dressing" here, because this coat is Burberry. Sign. Me. Up. Because this visit has been so hotly anticipated, we're going to do this open post-style. You may want to stay in touch, because because this post will continue to be updated. Detailed look at the jewels of the Welcome Ceremony for the Queen and the Duchess of Cornwall is right here.